The Chevy Bolt is one of the best selling EVs in the U.S. with sales increasing to over 17,000 through October of 2017. If you have recently purchased a Bolt or are considering the Bolt, you will want to start thinking about a charging plan, including a Level 2 charger for your home. Although a lot of Level 2 charging takes place at work locations (charging activity peaks during morning work arrival hours), home charging is also becoming more popular according to the Chargepoint 2017 Charging Forward Report. We put this guide together to find the best Level 2 charger for your new Bolt and understand options for charging away from home. The 2017 Chevy Bolt comes loaded with features to assist in managing charging at home and on the road. To get a quick overview without diving into the owners manual, we recommend the Getting to Know Your 2017 Bolt EV guide. 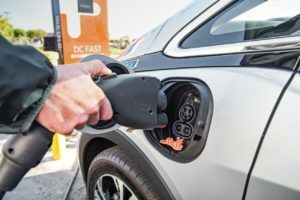 The Bolt EV comes standard with a 120V charger, but most owners elect to purchase a 240V charger, as discussed in more detail below. Programmable Charging – The Chevy Bolt offers 3 programmable charging options including immediately upon plug-in, delayed based on departure time, and delayed based on electricity rate and departure time. This feature will allow you to control charging times at home around lower time of use rates (typically at night) to reduce your overall cost per mile. 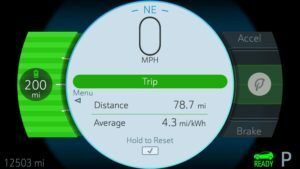 Charging Status – The Chevy Bolt comes with two charging status indicators on the instrumental panel near the windshield and on the illuminated charge port. Charging Control Panel – Charging settings are controlled through an instrumental panel that will also give you stats on your energy usage and driving efficiency. Location-Based Charging – This feature will automate charging settings if you are at or away from your home charging location. MyChevrolet App – The MyChevrolet app allows owners to search for near by charging stations, send remote commands, check the current battery charge level, and initiate charging. 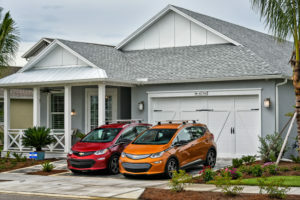 In December 2016, GM announced that it had selected AeroVironment as the official home charging station for the 2017 Chevy Bolt EV. Darin Gesse, the Bolt EV Product Manager said, “We selected AeroVironment due to their strong brand recognition, reputation for reliability, and decades of leadership in supporting EVs.” The AeroVironment charger is labeled with its own GM part number and is available through Chevy dealerships. AeroVironment has a 20+ year history with electric vehicles and touts that it co-developed the first modern electric car (EV-1) and has 7 vehicles in the Smithsonian. The company is also the only EV charger manufacturer that has official branded products with EV OEMs including Chevy, Ford, Nissan, Fiat, Kia and Hyundia. The AeroVironment 32-A charger is a wall-mounted unit with 240V and 32A charging power and is compatible with the Chevy Bolt’s J1772 electrical connector. The Chevy Bolt comes with a 7.2 kW high-voltage on-board charger and a 60 kWh lithium-ion battery (~238 miles of range). With the AeroVironment charger, the Bolt will charge at 25 miles per hour (the quick math is 238 miles/60 kWh battery = ~4 miles per kWh and 7.2 kW x 4 = ~28 miles per hour of charge). The Level 2 charger is 5x as fast as the Level 1 or 120V charger that comes standard with the Chevy Bolt and other EV models. The AeroVironment charger retails for just under $700 making it one of the most expensive EV Level 2 chargers currently on the market, so it is worth considering other alternatives. If you don’t want to hassle with purchasing a Level 2 charger and finding an installer, handling everything through the Chevy dealership may be a good option. However, Chevy Bolt owners should be aware that there are other high quality Level 2 chargers for less on the market and installation may also be less expensive than the Chevy dealership installation partners. OhmHome reviewed 4 other Level 2 chargers all of which are less expensive than the AeroVironment ($350 – $600) and have similar features. All of the models are greater than 30 amps, although there is also the option to purchase a 16 amp model that will yield lower charging. Two of the most popular models, the JuiceBox and the Chargepoint are $100 less than the AeroVironment and come with Wi-fi connectivity and advanced controls. Although not necessary, Wi-fi connectivity can be a cool feature for those that want to control their charging via Amazon Alexa or a smart-phone app. Many of the features you gain through a Wi-fi EV charger, including checking the battery level and initiating charging, can be done through advanced features of myChevrolet mobile app, so a basic EV charger model, like the Siemens Versicharge, may be a better fit. If you are taking a roadtrip in your Chevy Bolt, you will likely use DC fast charging. 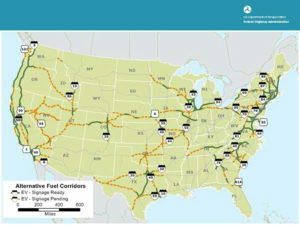 DC fast charging has expanded significantly in the U.S. and the Department of Transportation has established formal EV fast charging corridors. The Bolt EV uses the SAE Combined Charging Standard (CSS) for fast charging and it will take 30 minutes to recharge a depleted battery to 90 miles of EV range, although charge times may vary with temperature. We'll send you the latest solar and cleantech product reviews and deals to help you save money, time and the planet!